Each company has its own form of company quality. For companies with high corporate quality joy and pride are noticeable , force is effective , liveliness turns out, the company is healthy, has energy and can cope with challenges. Characteristics of corporate quality are for instance customer satisfaction, employee loyalty, high rate of innovation and expertise – also including the partners or suppliers. All stakeholders are taken into account in a balanced manner - this affects owners, employees, customers, partners, suppliers and society. For managers, it is about the continuous improvement of corporate quality. The recipe here: No big jumps, but the approach to make it little better every day. Corporate quality concerns, in the full sense of the word , the "nature" of the entire company , the current state in terms of both structure and activities as well as the attitudes, values and behaviors and the results actually achieved . High quality corporate means a comprehensive, with a long-term orientation on meeting the requirements of all stakeholders in a balanced form. Excellence (in the sense of the new EFQM Excellence Model 2013) is defined as the maximum possible degree of corporate quality for an organization. The EFQM Excellence Model 2013, which was revised with active participation of Quality Austria, combines the basic concepts of excellence with the weighted criteria and the RADAR Logic as well as possible. Quality Austria as a national partner organization offers the assessments (e.g. Validation for Comitted to Excellence, Assessment for Recognised for Excellence) and trainings harmonized all over Europe. The EFQM Excellence Model is a non-prescriptive framework based on nine criteria for assessing all relevant areas of an organization with regards to performance, customers, employees, society and processes. The evaluation is conducted by independent assessors. 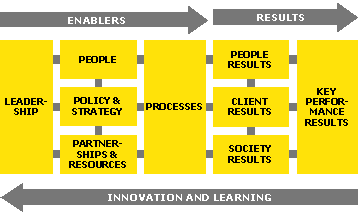 The model is based on nine criteria where Results criteria and Enabler criteria are the pillars of the model. The Results criteria represent the results that an organization actually achieves. They make results relating to employees, customers, society and key performance results comparable. The Enabler criteria show what an organization does in the areas of leadership, policy and strategy, employees, partnerships and resources. Innovation, creativity and learning close the cycle of the organization's continual advancement. The Excellence Model is a tool for compiling an organization's strengths and improvement potential in order to further develop the organization holistically. Optimization of sub-areas that do not support the organization's vision and strategy can be avoided by using the Excellence Model.